How to Buy Flowers for Funeral in Vietnam? Funeral flowers are a tradition dating back to ancient times, when the deceased were anointed with fragrant flowers and herbs. Flowers continue to be an integral part of the funeral service. They are often used to adorn the casket and/or burial site. Their beauty is meant to be a comfort to those who are grieving, and also to serve as a reminder of the spirit of life. If you are concerned with choosing flowers for funeral services, then you may follow these guidelines for how to buy flowers for a funeral. 1. Choose the funeral flowers. · Take into account the personality of the deceased, and of the grieving family. Consider what might be well received. For example, if you were especially close to the deceased, then you may know of a favorite flower or color and can choose accordingly, or you may opt to send in a bright arrangement to signify the deceased's energetic, charismatic nature. · Consider color meanings when choosing funeral flowers. For example, white represents peace and reverence, and blue represents comfort and calm; therefore, white and blue flowers may be a better choice for funeral floral arrangements than green flowers, which represent health and good fortune. · Respect the religious guidelines of the deceased and/or the bereaved. Call the funeral home ahead of time and ask about any applicable religious affiliations. For example, Muslims may be offended by cross arrangements, and those of the Eastern Orthodox faith place the highest value on white flowers for funeral services. 2. Determine the type of funeral floral arrangements you are interested in. There is funeral flower etiquette that dictates the type of arrangement that is most appropriate for you to contribute, based on your relationship to the deceased. Large spray arrangements that sit atop the casket should only be chosen by those closest to the deceased, such as immediate family. In the case that you had an especially close relationship with the deceased, it is appropriate that you choose flowers for funeral services that speak for the deceased's personality, life, interests, talents or legacy. These are called tributes. For example, if the deceased was a teacher, you may have the florist make a tribute in the shape of a book. · Children who are relatives of the deceased may bring floral pillows that can be placed on the casket. · For a child's funeral, floral arrangements in the shape of children's toys are common contributions. 3. Order the funeral flowers from a florist. Be prepared to provide the florist with information about the deceased, the bereaved and the service day, time and location. Additionally, have your message prepared for the floral card, which will be attached to the arrangement. · Local florists may know the deceased and/or bereaved personally, and could therefore offer advice regarding the best choice for funeral flowers. Additionally, local florists can tell you what local traditions and trends are regarding flowers for funerals, and may be more flexible than other florist options when it comes to delivery. · There are a number of online florists that allow you to view and choose from a variety of funeral floral arrangements from the comfort of your own home. 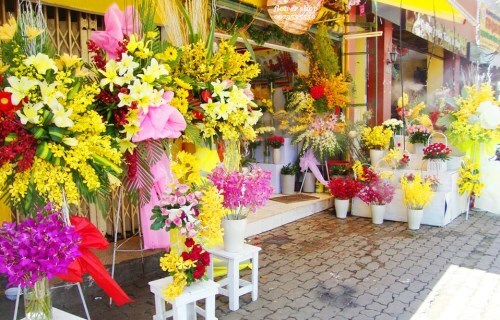 · If you are Vietnamese customers who live abroad or foreigners who live outside the territory of Vietnam, you can buy funeral flowers easily. Order funeral flowers online on our website and have your flowers delivered by local florist in Vietnam. · Also roses or carnations will be a good choice. 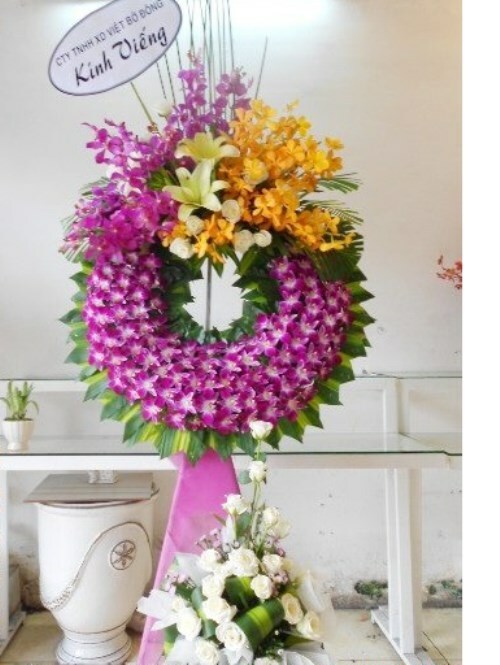 · If you are not sure about the type of flower to choose for the funeral, then it is also appropriate to send a potted plant to the family of the deceased. · You may opt to collect contributions from a number of people in order to purchase large-scale or expensive funeral flowers that can be from all of you. 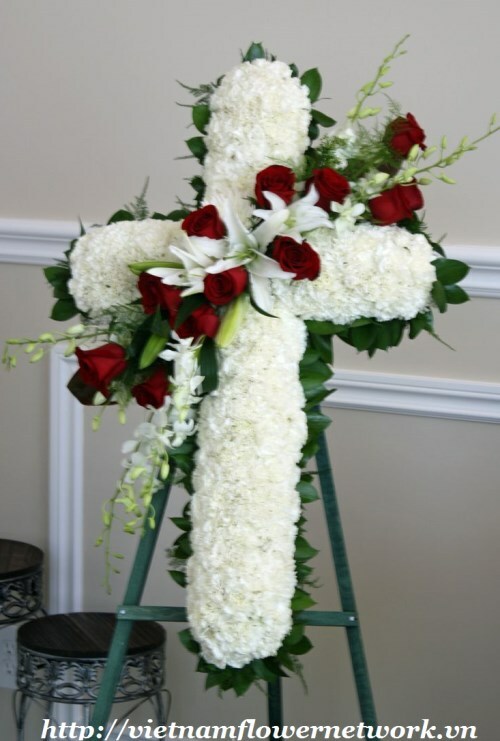 · You should consult with the funeral home before sending any type of non-traditional or alternative floral arrangement, such as arrangements in glass vases, as different funeral homes have different policies regarding funeral flower arrangements. 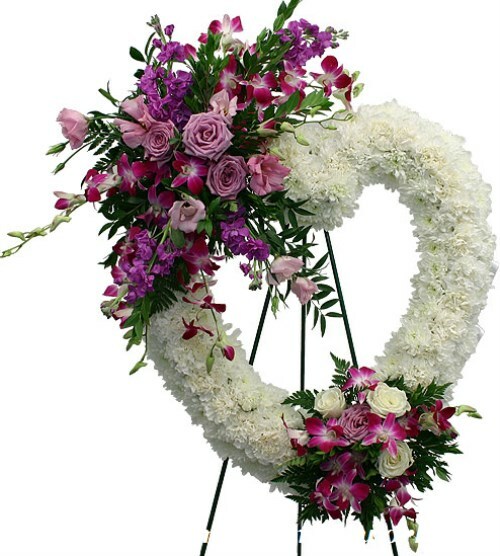 · Be aware that, even if the bereaved asks for charitable donations "in lieu of" funeral flower arrangements, it is still appropriate to purchase flowers for a funeral.